(Nashville, TN)—Zondervan Academic, a division of HarperCollins Christian Publishing, and BibleMesh, a producer of online courses for theological education, announced today a collaboration that will further both entities’ interest in distance learning. Online courses offered through this new collaboration will be available to colleges and seminaries for use in their curriculum, as well as to individuals interested in non-credit, online continuing education. The first courses will be available in November, 2015, with as many as twenty-five available by the fall of 2016. Courses will be taught by leading evangelical scholars, including Wayne Grudem, Andrew E. Hill, William D. Mounce, Gary D. Pratico, Miles V. Van Pelt, John H. Walton, and many others. Courses available in November will include Basics of Biblical Greek, Basics of Biblical Hebrew, Biblical Interpretation, New Testament Survey, and Old Testament Survey. In addition to making courses available to schools to use within their online programs, Zondervan and BibleMesh will make online courses available to individuals not enrolled in a college or seminary, with an option to get credit from a partner institution. Last year 72-percent of incoming college freshmen reported taking an online course the previous year. Many Christian colleges and seminaries have begun to offer online courses to meet the demand and stay competitive, seeing their importance for growing enrollment and leveraging new learning technologies. The new courses can be used as part of a traditional residential program, within a flipped classroom, or as part of online-only degree programs. 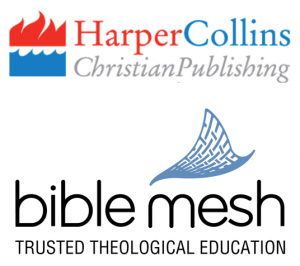 Schools can use them to supplement an existing online program or start a new program using courses with content from Zondervan Academic incorporated into the BibleMesh platform. To be notified when the first courses are available and to receive news and updates, sign up at http://zondervanacademic.com/online-courses-coming-soon/. About BibleMesh: A provider of cutting-edge online educational services, BibleMesh promotes understanding of the Christian scriptures and Christian discipleship. BibleMesh advances this mission through core curriculum development, particularly in the biblical languages, alongside strategic initiatives with content creators. BibleMesh was launched in 2010 by Emmanuel A. Kampouris, retired chairman, CEO, and president of American Standard Companies, Inc. and his wife Camille, an educator and performer best known for her work with The Jim Henson Company and Sesame Street. For additional information, please visit www.biblemesh.com. About HarperCollins Christian Publishing: The world’s leading Christian publisher, HarperCollins Christian Publishing Inc., comprises both Thomas Nelson and Zondervan publishing groups in addition to Olive Tree Bible Software. The Company produces bestselling Bibles, inspirational books, academic resources, curriculum, audio and digital content for the Christian market space. Also home to BibleGateway.com, the world’s largest Christian website, and FaithGateway.com, an online community dedicated to helping people grow in their faith. HarperCollins Christian Publishing is headquartered in Nashville, TN with additional offices in the U.S., Mexico and Brazil. For more information visit www.HarperCollinsChristian.com.